(Nanowerk Spotlight) You cut yourself in the finger - and a few days later your skin has completely healed again. Biological organisms have an amazing ability to automatically initiate self-healing and self-repair when they sustain damage. Materials engineers are dreaming about making materials that could do the same thing. Imagine self-repairing cars, planes, bridges or buildings. These materials could be of particular use in structures that are at present impractical or impossible to repair, such as electronic circuit boards, implanted medical devices or spacecraft. Self-repairing materials would have a massive impact on virtually all industries, lengthening product lifetimes, increasing safety, and lowering product costs by reducing maintenance requirements. Thanks to nanotechnology, these visions are coming closer to reality. One approach is the use of nanocontainers that possess the ability to release encapsulated active materials in a controlled way, leading to a new family of self-repairing coatings. "Development of a new generation of self-repairing coatings and bulk materials, which have both passive mechanical characteristics originated from matrix material and active response sensitive to changes in the local environment or to the integrity of the passive matrix, opens an avenue for the fabrication of future high-tech functional surfaces" says Dr. Helmuth Möhwald. " Novel feedback-active surfaces can be composed of a passive matrix inherited from a 'classical' approach for coatings and active structures for fast response of the coating properties to outer environmental impacts. The coatings have to provide release of the active and repairing material rapidly after changes in coating integrity." Möhwald, a director at the Max Planck Institute of Colloids and Interfaces in Potsdam, Germany, together with Dr. Dmitry Shchukin wrote a review on "Self-Repairing Coatings Containing Active Nanoreservoirs" in a recent issue of Small. Möhwald and Shchukin explain that there are basically two approaches to develop "smart" surfaces: 1) the fabrication of active composite-layered systems in which the passive coating matrix is alternated with layers bearing an active coating component (e.g., corrosion inhibitor, lubricant) or 2) the integration of nanoscale containers (carriers) loaded with the active components into existing traditional coatings. The first approach has significant shortcomings with regard to stability and self-repairing activity of the coating. Moreover, spontaneous leakage from the surface can occur during aging. 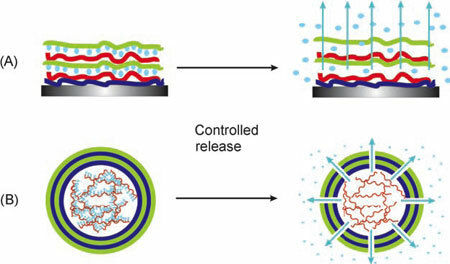 The second approach, loading active compounds into nanocontainers with a shell possessing controlled permeability and then to introduce them into the coating matrix, is much more promising. "Here, the nanocontainers are uniformly distributed in the passive matrix keeping active material in a 'trapped' state, thus avoiding the undesirable interaction between the active component and the passive matrix, leading to spontaneous leakage" says Shchukin. "When the local environment undergoes changes or if the active surface is affected by the outer impact, the nanocontainers respond to this signal and release encapsulated active material." The authors point out that the most important task for the second approach is to develop nanocontainers with good compatibility with the matrix components, the possibility to encapsulate and upkeep active material, and control of the permeability properties of the shell through external stimuli. "The nanocontainers should also be of a size less than 300–400 nm; nanocontainers of larger size can damage the integrity of the coating matrix forming large hollow cavities, which reduce the passive protective properties of the coating." The review discusses several types of coatings and self-healing or self-repairing mechanisms. The first one and the oldest one are self-repairing polymeric materials where micrometer-scale containers are introduced into the polymer body. Polymeric materials capable of smart self-repair consist of several parts: a stimulus to release the repairing chemical such as the cracking of a microcontainer; a microcontainer; a repair chemical monomer carried within; and a method of hardening the microcontainer load in the polymer matrix. "With very recent developments in nanotechnology, elaborate and multifunctional surface coatings with precise architectural and chemical control on the nanoscale are becoming easily accessible" says Möhwald. "Layer-by-layer deposition techniques, nanoparticle surface-modification chemistry, and nanoreactor chemistry are employed to construct thin-film coatings with distinct layered functional regions." Scanning vibrating electrode maps of the ionic currents measured at 200 µm above the surface of AA2024 aluminum alloy coated with an undoped hybrid film (a, c, d) and with a TiOx nanostructured coating (e, g, h) exposed to 0.05 Μ NaCl for 24 h (a, e). Then the defects presented in the microphotographs (b) and (f) were made. Scanning vibrating electrode scans were taken 5 min after defect formation (c, g) and 3 h after defect formation (d, h). Scanned area: 2x2 mm (Copyright, Elsevier Science B.V.). The aerospace and automotive industries are frontrunners in researching and employing nanotechnology. Visions of “nano in cars” range from contributions towards CO2-free engines, safe driving, reduced noise, self-healing bodies and windscreens, “chameleon” colors, and a self-forming car body. For now, self-healing in anticorrosion coatings is one of the more short-term achievable goals. For instance, a new organic composite coating for enhancing the corrosion resistance of Al–Zn alloy-coated steel sheets has been developed. The coating effects a self-healing action in cracks generated on the surface of the steel sheet while forming. Another interesting approach to achieve self-healing in anticorrosion coatings is to employ conductive polymers as a coating component. Here, responsive release of the inhibitor occurs only when the potential at the interface decreases at an active defect. In principle, the release of the active materials, for instance the corrosion inhibitors, occurs only when triggered by environmental (in this case: corrosion) processes or defects in the coating integrity, which prevents leakage of the active component out of the coating and increases coating durability. Not limited to anti-corrosion applications, an active coating can have several active functionalities (for instance antibacterial or antistatic) when several types of nanocontainers loaded with a corresponding active agent are incorporated simultaneously into a coating matrix, potentially leading to highly sophisticated surfaces. The authors point out, though, that so far only a few reports on the formation of active surfaces (mostly anticorrosion) based on the release of active material from incorporated nanocontainers are known. There still is a lot of work to be done before smart coatings become everyday reality. "In many cases, the detailed mechanisms of the nanocontainer permeability are not yet well understood" says Möhwald. "This requires additional efforts to investigate kinetic and structural properties of the nanocontainer shell and diffusion of the released active material inside the coating matrix. However, there is no doubt that nanocontainers will create countless new opportunities in research and also in technologies for the fabrication of active composite materials."